our sessions clock in at 45 minutes. Blinnk Photography – Fast. Fresh. Fun. Blinnk delivers a fast, fresh and fun photography experience, that’s perfect for families, couples, individuals and groups alike. Our team of highly skilled professional photographers follow a simple processes that allows us to deliver stunning high resolution photos at an amazingly affordable price. Each session is tailored to capture the spirit and personality of your group. 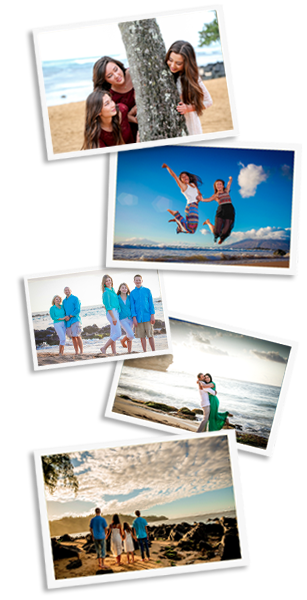 With photographers on Maui, Kona, Oahu, and Kauai; Blinnk Photography is setup to accommodate all of your photography needs. At Blinnk, we believe in the quality of our service and the ability of our team. This confidence allows us to break the rules of professional photography and offer photo shoots free of charge and with no obligation to buy. Instead, we allow our product to speak for itself. Simply contact us by phone or message to book your photography session date, time, and location. After booking your session you will receive an appointment confirmation email, as well as a reminder email the day prior to you scheduled photo session. In the emails we will also include some tips for what to wear and things you may want to bring with you. At your photo shoot, your experienced and friendly photographer will guide you through the various stages of the photo session while adapting to any specific requests you make. Your photographer will ensure that a variety of photos are taken and that the personality of your group and the beauty of the scenic backdrops are captured. After your photo shoot, your Blinnk photographer will head back to the studio and professionally process your photos for next day availability. Every photo will be manually processed and will be available to you in high resolution quality. Stop by our studio the next day for your scheduled review session. With Blinnk you are under no obligation to buy. Simply review your professionally produced photos and select the images you wish to purchase. Pick a little, or pick a lot, it is completely up to you.